To make these gift box cakes, I used 4 cake mixes, 2 strawberry and 2 red velvet. The bottom cake was 2 layers and each layer was 1 mix. The top cake was 3 layers. And the top layer was a smaller square pan than the bottom layers. I iced in buttercream and smoothed with a Viva towel. 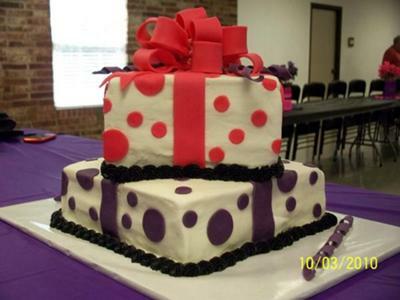 Then I added the dots, bow and ribbons out of fondant.